Lucky Wheel: May fortune smile upon you, brave warriors! Legacy of Discord - Furious Wings, GTArcade’s newest free to play action RPG game on mobile, is preparing a brand new event for players! 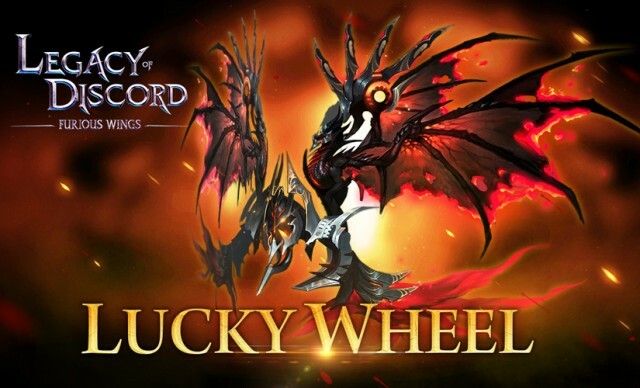 Test your fortune in the new Lucky Wheel, make it to the top and earn amazing rewards, including the newest Tier 10 Wrathwing: Immortal! 1. Spinning the Wheel will cost 100 Diamonds. Each player can spin 20 times each day at most. 4. Players can earn special Vouchers to spin the Wheel without Diamonds. Unused vouchers will be kept for the next Wheel event! May fortune smile upon you, brave warriors! Try your hand at Lucky Wheel for some fantastic rewards. Play Legacy of Discord - Furious Wings today and experience the best action RPG on mobile!